Each of these workplaces strive to create a culture of caring that includes supporting a company-wide annual workplace campaign enabling employees to donate through simple payroll deductions. These workplace campaigns require an investment of time and resources by the leadership of these organizations to plan and organize information sessions and special-themed events – all done in the spirit of working together to make a difference. In addition to financial investments, many of these workplaces encourage staff to volunteer on a regular basis through United Way. Some of the organizations that are among the Most Generous Workplaces also made the list of United Way Suncoast’s Top Volunteer Workplaces. Download the 2018 Most Generous Workplace Badges by clicking here. philanthropic contributions to and through United Way Suncoast during the previous fiscal year. The Suncoast region includes DeSoto, Hillsborough, Manatee, Pinellas and Sarasota counties. Combined, the top 100 organizations in the Suncoast region and their employees generously invested $16 million to help local communities through United Way Suncoast-led and supported programs in the areas of youth education, adult financial stability and support services. The Top 10 Organizations represent nearly $11 million in contributions, including corporate gifts, as well as employee giving through United Way Suncoast. Learn more about the future of corporate philanthropy. The United Way Suncoast 2018 Most Generous Workplaces in Manatee County are announced annually and determined by companies’ philanthropic contributions to and through United Way Suncoast during the previous fiscal year. Learn more about the future of philanthropy. The United Way Suncoast 2018 Most Generous Workplaces in Sarasota County are announced annually and determined by companies’ philanthropic contributions to and through United Way Suncoast during the previous fiscal year. The top 25 Most Generous Workplaces in Sarasota county represent nearly $1.4 million, which includes corporate gifts, as well as employee giving through United Way Suncoast. Publix Super Markets again leads the pack as the most generous workplace in the Suncoast region (DeSoto, Hillsborough, Manatee, Pinellas and Sarasota counties), followed by Raymond James Financial and Duke Energy, which made the biggest jump from last year to capture the #3 spot. In addition to its year-round efforts to support United Way through campaigning and employee volunteer activities, Duke Energy secured its spot on the list with a $1 million investment to support community empowerment at the United Way Resource Center in south St. Petersburg’s Campbell Park. The Most Generous Workplaces list is determined by companies’ philanthropic contributions (monetary and in-kind) to and through United Way Suncoast during the previous fiscal year. Combined, the top ten organizations and their employees generously invested $16.6 million to help local communities through United Way Suncoast-led and supported programs, a significant increase from last year’s contribution total of $11 million. View a complete list of the Top 100 Most Generous Workplaces in the Suncoast region. 13 Ferman Motor Car Company, Inc.
41 T. Rowe Price, Inc.
84 Universal Insurance Holding of N.A. 89 Delta Air Lines, Inc.
98 PCL Civil Constructors, Inc.
On October 18, 2017, United Way Suncoast announced its 2017 Most Generous Workplaces in Manatee County, determined by companies’ philanthropic contributions to and through United Way Suncoast during the previous fiscal year. The Top 25 most generous workplaces in Manatee County represent $1.6 million in monetary and in-kind contributions. Each of these organizations incorporate philanthropy into its business culture in a uniquely personal way. 16 Raymond James & Associates, Inc. Combined, the top 100 organizations in the Suncoast region (DeSoto, Hillsborough, Manatee, Pinellas and Sarasota counties) and their employees generously invested $16.6 million to help local communities through United Way Suncoast-led and supported programs. Complete lists of the Most Generous Workplaces in Manatee, Sarasota and across the Suncoast region are available online. United Way Suncoast has announced its 2017 Most Generous Workplaces in Sarasota County, determined by companies’ philanthropic contributions to and through United Way Suncoast during the previous fiscal year. The Top 25 most generous workplaces in Sarasota County represent $1.5 million in monetary and in-kind contributions. 12 Universal Insurance Holding of N.A. 21 Kerkering, Barberio & Co.
24 Comcast Cable Communications, Inc.
Each of the organizations has incorporated philanthropy into its business culture in a uniquely personal way. For example, Northern Trust has chosen United Way as its philanthropic partner for decades. The company has a long-standing corporate commitment to making a positive impact in the communities in which it operates, particularly in the Sarasota area. In addition to its fundraising campaign, Northern Trust supports the community by giving employees the opportunity to participate in the annual Day of Caring volunteer event in Sarasota. “Northern Trust is a shining example of how companies, their employees and non-profits can work together to make our neighborhoods even better places to live,” added McCormick. Combined, the top 100 organizations in the Suncoast region (DeSoto, Hillsborough, Manatee, Pinellas and Sarasota counties) and their employees generously invested $16.6 million to help local communities through United Way Suncoast-led and supported programs, a significant increase from last year’s contribution total of $11 million. View complete lists of the Most Generous Workplaces in Sarasota, Manatee, and the Suncoast region. 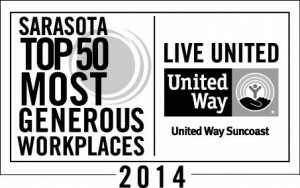 TAMPA, Fla. – December, 2016 – Publix Supermarkets again reigns as the number one most generous workplace in the Suncoast region (DeSoto, Hillsborough, Pinellas and Sarasota counties), as recognized by United Way Suncoast in its annual Most Generous Workplaces list. The leaders are determined by their philanthropic contributions (monetary and in-kind) to and through United Way Suncoast during the previous fiscal year. Combined, the top ten organizations and their employees generously invested close to $11 million to help the local community through United Way Suncoast-led and -supported programs. 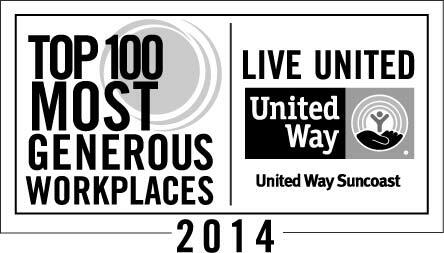 View a complete list of the Top 100 Most Generous Workplaces in the Suncoast region. 15 Ferman Motor Car Company, Inc.
32 Time Customer Service, Inc.
47 T. Rowe Price, Inc.
53 PCL Civil Constructors, Inc.
80 Universal Insurance Holding of N.A. 98 Delta Air Lines, Inc.
Publix Supermarkets again reigns as the number one most generous workplace in the Sarasota area (DeSoto and Sarasota counties), as recognized by United Way Suncoast in its annual Most Generous Workplaces list. The leaders are determined by their philanthropic contributions (monetary and in-kind) to and through United Way Suncoast during the previous fiscal year. Combined, the top ten organizations and their employees generously invested more than $1 million to help local communities through United Way Suncoast-led and -supported programs. View a complete list of the Top 50 Most Generous Workplaces in the Sarasota area. 1 Publix Super Markets, Inc.
22 Kerkering, Barberio & Co., P.A. In October, 2015, United Way Suncoast released its annual 100 Most Generous Workplaces in the Suncoast region (DeSoto, Hillsborough, Pinellas and Sarasota counties) for 2015. 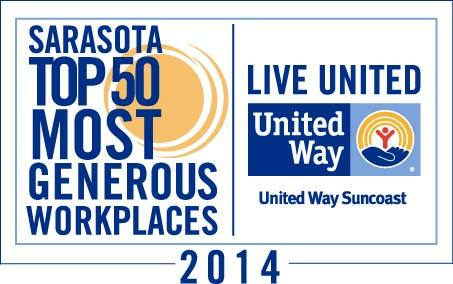 Roughly 800 Suncoast-area workplaces partner with United Way. These Top 100 companies serve as role models for corporate social responsibility. The Top 100 was determined by their philanthropic contributions (monetary and in-kind) to and through United Way Suncoast by the organization during the previous fiscal year. Combined, the top 10 organizations and their employees generously invested more than $11 million to help our local community through United Way Suncoast-led and supported programs. 12) Ferman Motor Car Company, Inc.
20) PCL Civil Constructors, Inc.
41) T. Rowe Price, Inc.
92) Delta Air Lines, Inc. In October, 2015, United Way Suncoast released its annual 50 Most Generous Workplaces in the Sarasota Area (DeSoto and Sarasota Counties) for 2015. Roughly 800 Suncoast-area workplaces partner with United Way across the region. These Top 50 local companies serve as role models for corporate social responsibility. 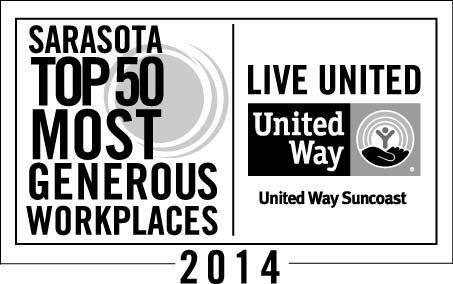 The Top 50 was determined by their philanthropic contributions (monetary and in-kind) to and through United Way Suncoast by the organization during the previous fiscal year. 1) Publix Super Markets, Inc.
19) Kerkering, Barberio & Co., P.A. 29) Comcast Cable Communications, Inc.
32) Universal Insurance Holding of N.A. We are honored to work with you and delighted to be able to recognize your commitment to helping ensure everyone has an opportunity to have a better life. Below are a variety of downloads (color and black and white) which we encourage you to use on your website, annual report, sales or recruiting collateral or anywhere you want to demonstrate your outstanding achievement. NOTE: Click on the image and then right click to save the .jpg to your desired location. All designs are also available in .eps format by request by contacting jwilliams@uwsuncoast.org or abradford@uwsuncoast.org.